You don't stand a chance of outrunning it. While not as cool as the , this one-off ‘Copzilla’ created by Nissan for the upcoming New York Auto Show is still pretty sweet. Based on the , Police Pursuit #23 comes loaded with bull bars, flashing red and blue lights, and a scrolling LED bar up front. Mechanical modifications are limited to a lowered suspension giving it a more stanced look, with the twin-turbo V6 remaining unchanged with 562 hp and 469 lb-ft of torque. Clearly that was deemed more than enough for the boys in blue of the fictional Skyline Metro Police Department. Exterior enhancements are a lot more interesting with a carbon-fiber widebody kit that includes a giant rear wing, chunky pieces of metal up front, tinted windows, gold stripes running along the sides, and a mean set of 22-inch alloys with obligatory spikes sticking out of them. 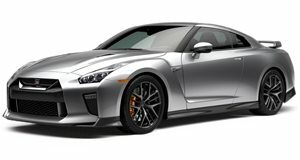 The one-off GT-R Police Pursuit will be joined in New York but the , which slots somewhere between the stock car and the GT-R Nismo, as well as the just-unveiled .